Seahawks cornerback Richard Sherman's been a center of attention for one reason or another almost all year. We'd say "lightning rod," but in truth, much of the attention he's received has been positive, for how well he's played. Sherman picked off eight passes this year, returned one for a touchdown, was credited with 24 passes defended, and pitched in 64 tackles for good measure. He didn't make the Pro Bowl, but that doesn't mean his play didn't merit it - he quickly grew into one of the NFL's best at his position in just his second year out of Stanford. More often than not, though, his great performances were overshadowed by controversy. There was this entry into the annals of NFL trolldom. Clearly, a guy unafraid to get under opponents' skin. But even that didn't grab as many headlines as Sherman's failed drug test and resulting suspension earlier this season, and even that didn't attract as much attention as his successful appeal of that suspension. So it's safe to say he's gotten under the NFL establishment's skin, too. This dustup got a bit lost in the postgame deluge of RGIII outrage, but it's well worth another look because: 1) brawl-induced face mushings of this sort almost can't help but be hilarious; and 2) while most of the attention focused on RGIII, Sherman's the guy you'll still see playing next week, meaning fresh potential for another feud... and the glorious possibility of him facing off against the division rival 49ers - not to mention his college coach, Jim Harbaugh - for a spot in the Super Bowl. 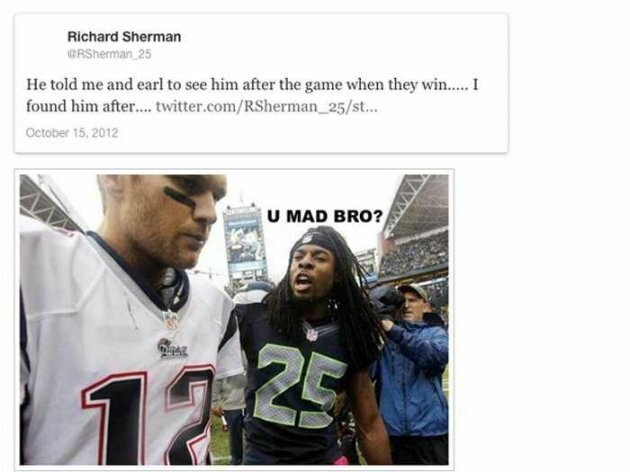 If that happens, we'll all be on high alert for Sherman shenanigans. Keep making enemies, Richard. It's working for you.